So, California weather finally decided to get with the times—it was 49 degrees when I woke up the other day. F o r t y-n i n e. For Californians, that’s like 10 degrees because we are pathetic creatures who wear knit hats when it’s 80 because, according to a calendar, it’s winter. Even though I may have complained a bit about goosebumps and the fact that I only got to use my new air conditioner for a week, I’m actually ecstatic about the temperature change. Cold weather = soup season = heart eyes emoji. Simple as that. I came across this recipe one winter while I was living in Minneapolis and it’s been a go-to ever since. 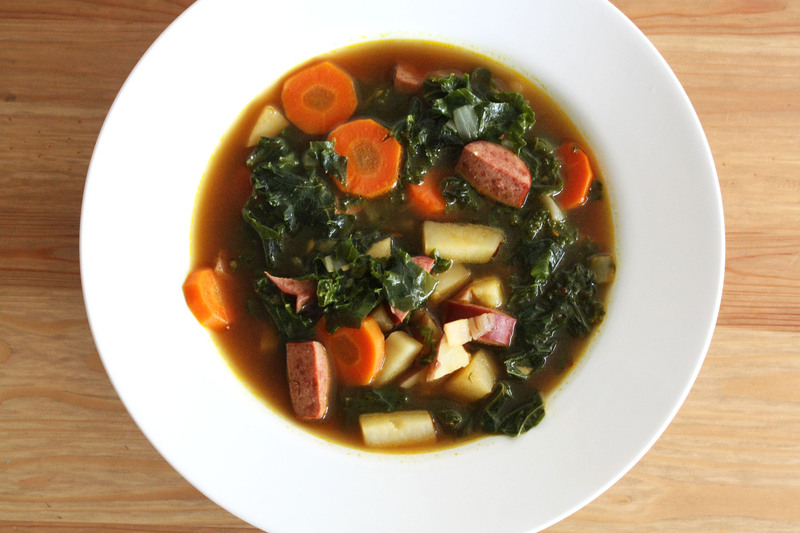 It’s super healthy, but still very satisfying and hearty with all the chunks of potatoes and sausage. I think that’s one of the constant struggles with eating healthy—trying to find something that fills you up (and tastes good), without breaking the calorie bank. And this soup does exactly that. Another thing I love about soup in general, is how versatile the ingredients can be. I chose specific veggies for this one, but you can really interchange them with any you’d like (think: butternut squash, bell peppers, celery, beans, etc). As long as they’re firm enough to hold up in the broth without breaking down (think: spinach) feel free to throw them in. And you can always use whatever sausage you like or have on hand. Chorizo or spicy Italian sausage would be awesome, I bet. Start by chopping up all your veg. The soup should have nice, big chunks, so don’t dice them too finely. I left the skin on the potatoes, but feel free to peel them first if you’d like. Heat a small amount olive oil in a large soup pot over med-low heat. Cut the sausage into thin slices and add it to the pot (if you’re using uncooked sausage, cook it whole and slice it later). Once brown, take sausage out of the pot and set aside. Add a little more oil to the pot, along with the onions and carrots. Cook over medium heat until slightly soft and translucent. Add the garlic and cook for another minute. Add the broth and water, along with the salt and pepper to taste. Bring to a boil and cook for 5 minutes. Add the potatoes, sausage, and red pepper flakes and bring to a simmer. Cover and cook for another 5 minutes. Add the kale and bring back to a simmer. Cook, partially covered for 5-10 minutes, until the potatoes are cooked through. Adjust seasonings.